Students love games. A little competition can often bring out the best in them. A Grammar Throwdown is a very simple yet effective game you can bring to any class to reinforce the grammar your students are studying or need to review. The concept comes from the television show, Throwdown! With Bobby Flay, where celebrity chef Bobby Flay challenges other chefs to a cook-off of their signature dish. It has the element of surprise, and it pushes each chef to do his or her very best. A Grammar Throwdown puts students head-to-head in a kind of grammar treasure hunt, where they are racing to correct their peers’ sentences. Students respond well to it, and it is yet another chance for a little extra instruction on persistent grammatical errors your students are making. Collect example sentences from your students’ writing. Look for ones that contain common errors, such as with subject-verb agreement or verb tenses. Choose 5 of the sentences and type them up. You can fit 4-5 sets of the sentences on one page to save paper. An example Grammar Throwdown from an upper-intermediate writing class. Fix the sentences so that there is only one kind of error per sentence. This will ensure the activity does not go too long. Put the students into pairs. Before you give them the sentences, tell them that there is one error in each sentence, and their job is to find and correct it. When they think they are finished with all five, they should raise their hand. Pass out one set of sentences to each pair. When students raise their hand, check the sentences. Circle any items that are still incorrect, and tell them to continue working. Allow for two sets of winners. This will give slower students more time to work on correcting the sentences. Consider giving the winners a prize, such as a piece of candy or chocolate. Bring the class’s attention to your screen. Project the sentences, and have the winners read their corrected sentences. Correct the sentences on the projector (or board). Use the discussion to clarify any misunderstandings. Consider doing a quick mini-lesson on one of the grammar points, especially if it is a persistent error. *As an alternative, make all the sentences contain the same kind of error, such as run-ons or articles. This is a good way to lead into a mini-lesson. The whole activity should only take about 10 minutes without a mini-lesson. It can a very useful warm-up activity, especially for those early morning classes. It also brings a little more fun to the typically dry task of error correction. And the chocolate doesn’t hurt either. 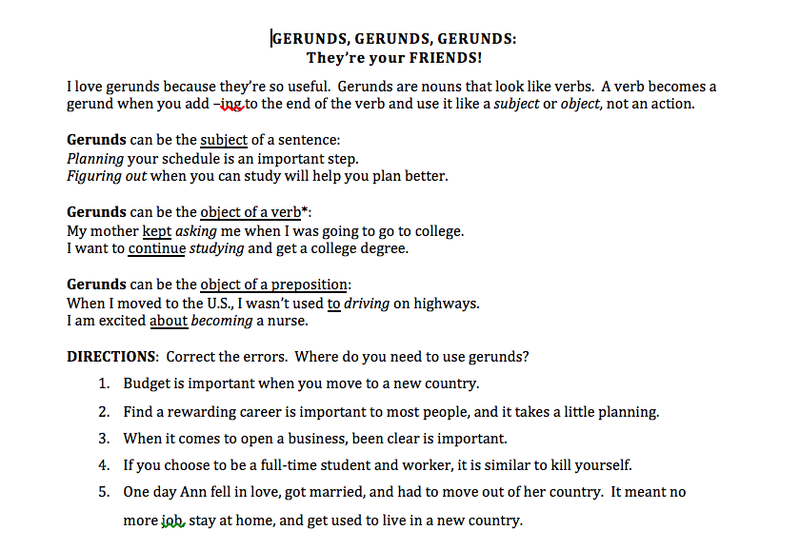 An example mini-lesson on gerunds.